(Manhattan Beach, CA – April 6, 2019) -- The Independent Book Publishers Association (IBPA) – www.ibpa-online.org – officially announced finalists in its prestigious IBPA Benjamin Franklin Awards™ program, recognizing excellence and innovation in independent publishing. Connie Bombaci, Killingworth author of Hogan’s Hope: A Deaf Dog, A Courageous Journey, and A Christian’s Faith received the Silver in the category of Inspiration. All finalists were recognized during an awards ceremony on April 5, 2019, in Chicago, Illinois where silver and gold recipients received their award in each of fifty-four categories. Connie Bombaci was also the recipient of a full scholarship to this year’s IBPA Publishing University. Additionally, for two years in a row, different editions of her book both won the Benjamin Franklin Silver Award, which is quite a distinction. The full list of finalists in all fifty-four categories is available at the IBPA WEBSITE. Over 1500 entrants were judged in this year's award program. Hogan’s Hope is available at Amazon, Barnes and Noble, and local bookstores. 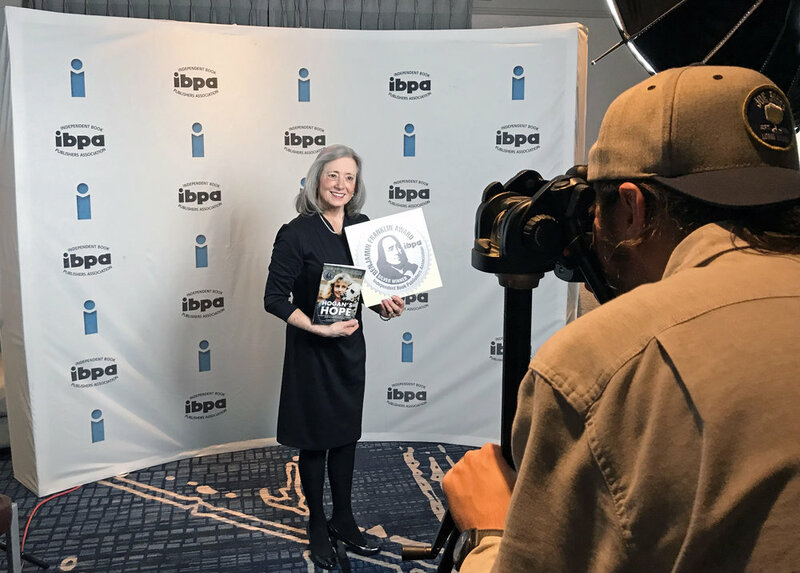 "The mission of the IBPA Benjamin Franklin Awards™ is simple: to recognize excellence and innovation in independent publishing," said IBPA CEO Angela Bole. "Unlike many other award programs, the IBPA Benjamin Franklin Awards™ demand both editorial and design excellence and entrants are judged independently on both." This year, over 160 librarians, booksellers, and design and editorial experts – most of whom have decades of book industry experience – judged the books submitted to the IBPA Benjamin Franklin Award™ program. The judging process took seven months, beginning in September 2018 and continuing into March 2019. At the end of the process, over 1,500 unique entrants will receive a written critique from each of the three judges who reviewed their book. The critiques include constructive feedback to help each publisher understand how their book is being perceived by industry professionals, upholding part of IBPA’s mission to serve the independent publishing community through education. This level of detail has helped the IBPA Benjamin Franklin Award™ program remain one of the highest national honors for independent publishers for over 30 years. "When our awards program started,” said IBPA COO Terry Nathan, "we were one of the only ones around. Since then, many other programs have come and gone, but we are proud that our awards continue to do what they did when IBPA started, and that is to help our members improve their publishing programs." IBPA members and friends were invited to help celebrate the finalists during the April 5, 2019 awards ceremony, a gala dinner programmed at the end of the first day of IBPA Publishing University. Both the ceremony and the conference took place at the Chicago Marriott Downtown Magnificent Mile in Chicago, Illinois. Sign up with your email address to receive our latest blog on news and the needs of our special, four-legged family members. We respect your privacy and will never give out any of your information. Thank you! We look forward to hearing from you.